Facebook users in the United States who want to run certain ads on the platform will need to hand over the last four digits of their social security number and a picture of a government-issued ID. The social network now requires anyone who wants to run ads related to political campaigns, civil rights, immigration, guns, economy, and other issues, to prove they're in the United States. Part of the proof required is the last four digits of your Social Security number. The move is part of a series of initiatives by Facebook to increase transparency on the platform after a Russian government-linked troll group spent thousands of rubles on Facebook ads targeting Americsans ahead of the 2016 presidential election. In addition to a Social Security number, users wishing to buy ads will need to provide a picture of a government-issued ID and a US mailing address. Once Facebook verifies the information submitted, the company will mail a code to the provided address to authorize the user's Facebook account to buy ads. Facebook declined to share what services it uses to verify Social Security numbers and other personal details. The company said it will delete the information after verification. "This normally happens within six weeks," the company says on its website. Qualifying ads will include a "paid for by" tag and will be saved in a political ad archive. 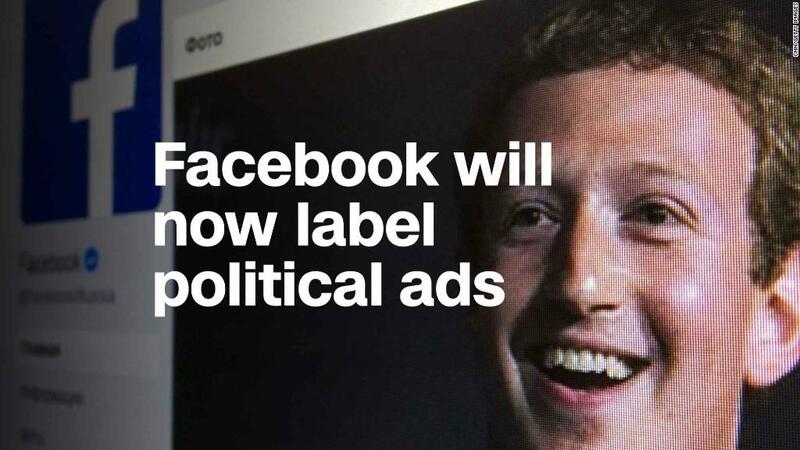 As recently as last month, Facebook said ads would also include the tag "Political Ad." This is no longer the case. The change, Facebook told CNN, is because advertisers that might not traditionally be considered "political" will also be subject to the new rules. It's not only ads advocating for or against a political candidate that qualify for the archive. Any ad mentioning a candidate will be subject to the new rules. In April, Facebook released a list of 20 "issues" -- including as abortion, education, guns, health, immigration, military and terrorism -- that apply to the new approval process. The last issue on Facebook's list is "values," which the company considers "issues that discuss the values used in determining societal standards, such as patriotism." The new rules mean many marketing campaigns will be subject to the new guidelines. For instance, Super Bowl ads that have in recent years taken on a more socially conscious tone. Some companies run sponsored digital versions of their ads on Facebook after they air on television. Some news publishers, which promote articles via Facebook ads, have taken issue with the rules. The News Media Alliance, a trade group that represents publishers including the Wall Street Journal and The New York Times, wrote to Facebook last Friday asking for an exemption from the rules. The group is concerned that the inclusion of news stories alongside partisan political ads conflates the two. "Newsgathering and reporting about politics is not the same thing as advocacy or politics," the letter said. The News Media Alliance did not outline how Facebook should decide what qualifies as a news outlet. In response to the letter, Campbell Brown, Facebook's head of news partnerships, said in a statement, "We recognize the news content about politics is different and we are working with publishers to develop the right approach." Last week, CNN reviewed the active Facebook ad campaigns of more than a dozen US and international news outlets popular on the social networking site. 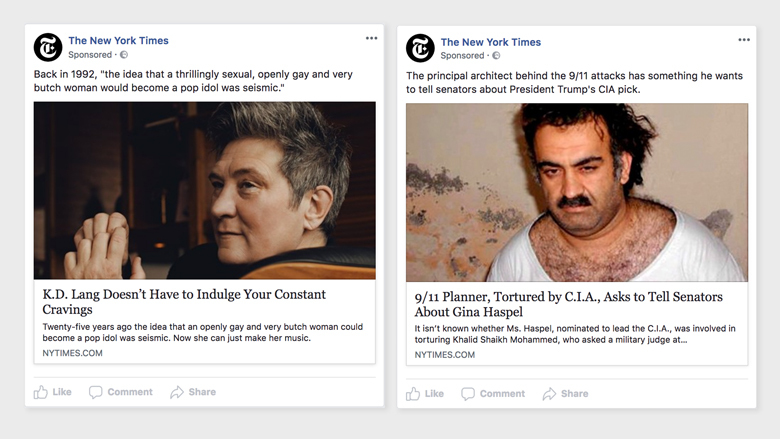 Only The New York Times and online video publisher NowThis News were running ads on Thursday, according to Facebook's "view ads" feature — a tool the company is testing in Ireland and Canada, and allows users to see what pages are running ads. CNN sent Facebook a selection of those ads to ask what the company would deem political. "The principal architect behind the 9/11 attacks has something he wants to tell senators about President Trump's CIA pick," said the text of one ad, which linked to a The New York Times article. Facebook told CNN the ad "would be deemed political content as it references President Trump." This means the ad would include details about who paid for it and be included in the political ad archive. Another ad run by The New York Times included the following text: "Back in 1992, 'the idea that a thrilling sexual, openly gay and very butch woman would become a pop idol was seismic," and linked to an article headlined "K.D. Lang Doesn't Have to Indulge Your Constant Cravings." Facebook said ads about civil rights will be subject to its stricter rules but the company told CNN this particular ad "would not be deemed political or issue content as it focuses on the journey of an individual rather than a civil rights discussion." CNN also asked Facebook if the same ad was running in a state where there was a ballot initiative on civil rights would it then be considered an issue or political ad. The company did not provide a response. Facebook says it plans to hire up to 4,000 more people to review and verify political ads. Their role will likely include navigating the nuance of what is and isn't political. Antonio Garcia-Martinez, a former product manger on the Facebook ad team, said that he believes the company is hoping to get ahead of any potential regulation of ads on social media. He said he thought verifying ad-buyers was a good idea, but added "there's this law of Facebook outrage." "No matter which choice they make they're going to have a howling chorus of people complaining about it," Garcia-Martinez said.